What would it be worth to you if you could double the profits in your business? What would your life be like if you could double your productivity? Sound too good to be true? It sounds like a long shot right? 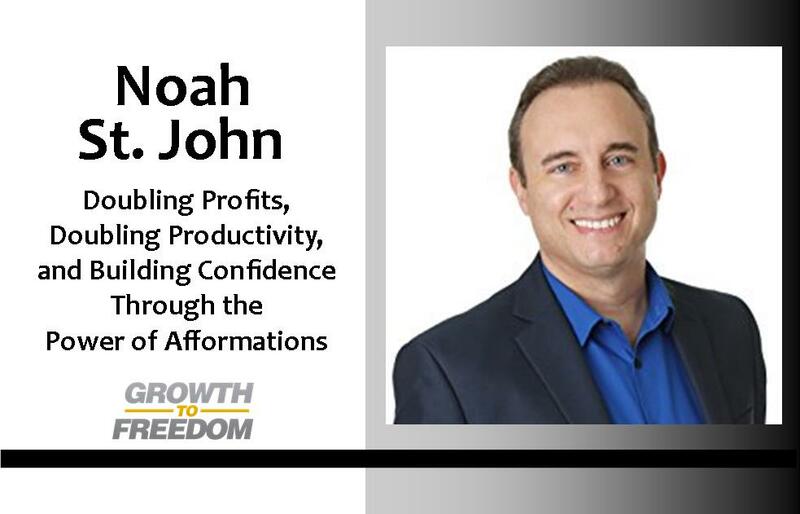 Today’s guest, Noah St. John, is an expert at helping small business owners do both, and he is on a mission to help 10,000 small businesses double their profits within this next year. On this episode of Growth To Freedom he shares many of the principles that he teaches and uses to equip business owners to make that happen in their current strategies and how to discover and implement new strategies to crank up their business profits. One of the most powerful strategies that Noah teaches is what he calls “The Profit Automation System.” It’s a powerful concept that enables you to look at the three ways your business revenue can increase and discern how you can implement the simplest and most effective strategies to see your profit margins move higher. You won’t want to miss what Noah has to share in this conversation with Dan Kuschell. When it comes to productivity, Noah St. John has plenty of great tips to share. One of the many strategies he discusses is “The 90-Minute Uninterrupted Interval.” Imagine being able to go start to finish and publish a book in 30-days. Noah shares the concept in this interview – and it will help you get more done in less time as well as give you greater focus, clarity, and confidence. [16:26] Advice for developing kids with leadership;.